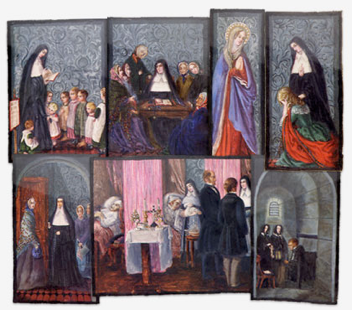 The story of the Sisters of Mercy in Australia and Papua New Guinea begins in Ireland on December 12, 1831 when Catherine McAuley, along with two companions, Anna Maria Doyle and Elizabeth Harley, professed their vows and became the first Sisters of Mercy. Much is written about why Catherine, at the age of 53, founded a religious order. Here it is enough to say that she recognised it as God’s way of enabling her and the several women who had joined her, to continue their critical work among the poorest people of Dublin. 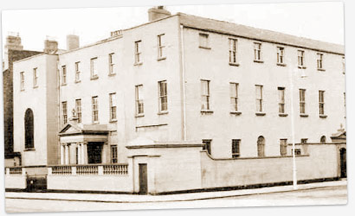 That work began systematically in 1827 with the opening of the House of Mercy which Catherine had built and equipped with her own inheritance. Dedicated to Mary the Mother of Mercy and given over to Works of Mercy, it was a centre to which people came for refuge and from which Catherine and her friends went daily into the streets and hovels caring for the sick and dispossessed. In a real way, the House of Mercy witnessed to Catherine’s life-time concerns. Influenced by her father, a man of faith and refined social conscience, from early childhood she had demonstrated deep sensitivity to people who suffered the extremes of poverty and all her adult life she had cared for those who were destitute, denied education, meaningful employment or any other opportunity to achieve a fair quality of life. 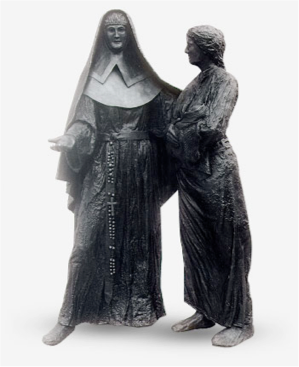 Statue of Catherine McAuley by Michael Burke, commissioned for the opening of Mercy International Center in 1994. There is a sense in which Catherine and the women she inspired to join her could be regarded as social reformers. In a society marred by socio-political forces that protected the privileged and oppressed the poor, the majority of whom were Catholics, they spent themselves and their resources trying to confront the causes of chronic poverty and to alleviate its demeaning effects such as ignorance, ill health and homelessness. And while their outreach was to all, they had a special care for young women and girls vulnerable to exploitation. However, before they were social reformers, these Sisters of Mercy were women of Gospel faith. They believed that God, in whose image every person is created, is the source of human dignity. They understood that God, self-revealing in Jesus, is full of compassion and that no-one is unworthy of God’s love. They were convinced that if God’s wisdom and justice guides the leaders of a society, no person need be excluded from life-giving opportunities. Catherine exemplified such faith. It was at the heart of all the ways in which she carried out the corporal and spiritual works of mercy (Isaiah 58:6 -10; Matthew 25:34 – 40). And it was her whole-hearted commitment to serving those who were longing for God’s Mercy that encouraged other women to share in her life’s work. Corporal and Spiritual Works of Mercy drawn by Sr. Clare Agnew, during her novitiate days in Ireland, printed in London 1840. Courtesy of the Institute of Our Lady of Mercy, Great Britain and Mercy International Centre. For I was hungry and you gave me to eat. I was thirsty and you gave me to drink. I was in need and you clothed me. I was a stranger and you took me in. I was a prisoner and you visited me. Enable and support women and children. Those that instruct many unto justice shall shine like stars for all eternity. I was in distress and you counselled me. I was sorrowful and you comforted me. I was abused and you gave me support and comfort. I offended you and you forgave me. and two in England. Wherever they were, the sisters tried to respond to needs too long neglected. provided refuge for homeless people, and befriended prisoners and their families.